Abundant sources of light are easy to take for granted in the developed world. Yet every day after sundown, 1.3 billion people around the world are forced to use kerosene, candles or disposable batteries which can cost over 100 times the price of the equivalent source of energy in the West. 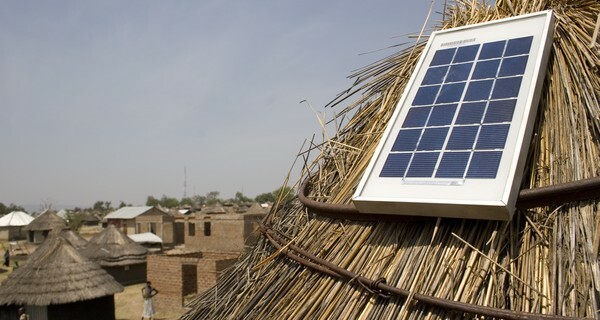 Azuri’s PayGo solar systems give people clean and affordable power in 11 countries across sub-Saharan Africa, creating economic growth at a local level by allowing businesses to stay open after dark and improving safety and visibility at night. Azuri’s entry-level system provides eight hours of clean lighting and mobile phone charging at home. This includes a durable 10W solar panel and four high-brightness LED lamps, providing a total output of 300 lumens. A USB port, with charging cable and connectors for most mobile phones, and full digital switching allows the user to control all lights and charging from the central unit. What’s more, the system adapts output depending on weather conditions and usage. By tracking how and when the light is used, the patented HomeSmart technology optimises charge times and brightness to deliver the best performance over the course of the day. For example, during the rainy season when light is limited, the system will automatically adapt to provide light for longer in dark evenings and early mornings. After a one-off installation fee, users maintain the unit with scratchcard top-up phone payments. Crucially, this is set up to be cheaper than their weekly spend on kerosene, so savings on the household budget are guaranteed. The technology is revolutionising light usage. 97% of users claim that their children study more, that kerosene use has dropped and that beneficiaries save 50% on energy each week. To find out more about Azuri technologies, visit the UK-based company’s pages at http://www.azuri-technologies.com.